1 – How do TDI Desiccator Cabinets work? 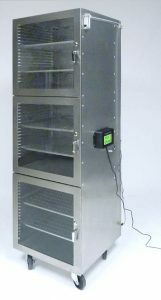 The primary purpose of a desiccator cabinet is to establish precise relative humidity levels to protect moisture sensitive materials in a clean environment. 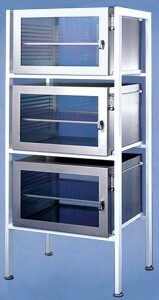 TDI desiccator cabinets require a continuous in-line nitrogen (N2) or clean dry air (CDA) source. (Our flowmeter and Nitro-Save® are not designed to work with Argon.) The N2/CDA goes in through the flowmeter to the plenum chamber. The gas then flows evenly into and between the chambers via our Ultra Nitro-Flow system and excess N2/CDA is automatically bled off via the bleeder valve at the bottom of the cabinet. TDI desiccators do not require and are not compatible with desiccants or any other types of drying agents. 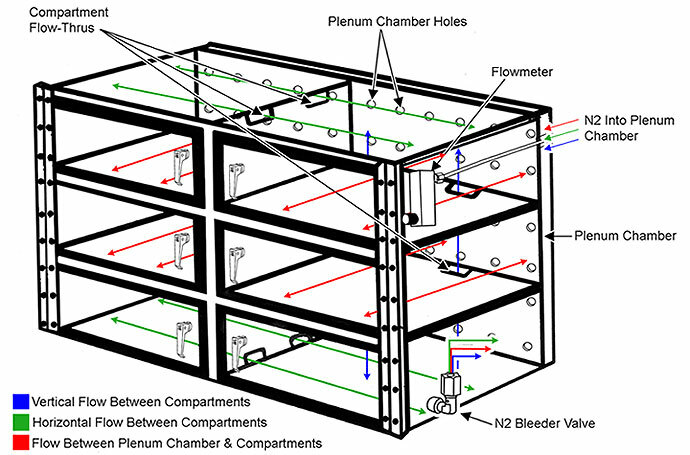 All TDI multi-chamber acrylic and stainless steel desiccators are constructed with our unique Ultra Nitro-Flow system, as shown in the above diagram. The individual chambers have cut-out notches allowing maximum gas flow in both the vertical and horizontal directions and reduce the higher moisture humidity conditions between compartments. 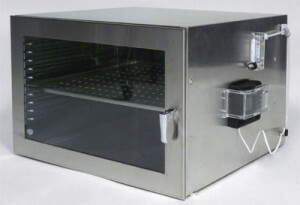 This, in tandem with the perforated plenum chamber, achieves a single pressure and atmosphere condition throughout the entire desiccator cabinet. A flowmeter is used to measure and control airflow, while a bleeder valve continuously relieves excess N2/CDA automatically. Because of the Ultra Nitro Flow design, only one bleeder valve is required per multiple compartment cabinets. The bleeder valve is located on the lowest compartment. A digital hygrometer will give you a readout of the relative humidity level in your desiccator, as well as a readout of temperature. To control pre-set humidity a Nitro-Save® unit would be chosen in lieu of a digital hygrometer. Our Nitro-Save® is a solid-state monitoring system capable of maintaining relative humidity control to <5%RH. Continuous in-line N2/CDA are required in order to use Nitro-Save®. All multi-chamber desiccators include a plenum chamber with a removable back plenum wall for easy access and maintenance in humidity control applications. The Nitro-Save® solenoid valve is mounted in the plenum chamber to regulate the nitrogen flow in response to the high humidity set point. This unit must be operated at 80 PSI (min) to 100 PSI (max) for optimum performance. 2. How do I Choose the Right Type of Desiccator Cabinet for my Application? Now that you know how our desiccators work, it’s time to choose the best material for your specific application. There are many factors to consider when making your decision, and we are always here to help you! Give us a call at 520-799-8000 or email us at equipment@tdiinterational.com for more help with your specific situation. Clear Acrylic Desiccators are recommended for non-electro-static (ESD) sensitive storage applications. Often these desiccators are utilized in cleanroom storage of wafers, reticles, photomasks and other contents less susceptible to ESD discharge events. Although acrylic desiccator cabinets may attain a highly charged condition, it can be mitigated with the proper precautions. Cleanrooms routinely maintain 45/55% relative humidity control, which provides a layer of moisture on exposed surfaces. This conductive layer facilitates discharging the static electricity to ground. Grounding is recommended on acrylic desiccators to accelerate these discharges. Static Dissipative Acrylic Desiccators provide complete electrostatic discharge protection for ESD sensitive cleanroom and/or assembly components. Our static dissipative acrylic material offers a surface resistivity of 106-108 Ohms/sq. and cannot be tribocharged when properly grounded. Stainless steel shelves, plates, shelf racks, latches, and hinges are common-grounded to the desiccator and wire connect to hard ground. Stainless steel plates are required for enhanced grounding and provide protection form surface abrasion when the floor of the compartment is utilized as a shelf. Although static dissipative acrylic desiccators are recommended for electrostatic discharge (ESD) sensitive storage applications, clear acrylic desiccators may be utilized as an economic alternative in certain applications. To use a clear acrylic desiccator to store ESD sensitive components you must include stainless steel shelves and compartment floor plates all properly grounded. The components must be stored in ESD safe storage bags, totes or another type of protective packaging. Clear acrylic desiccators remain susceptible on the acrylic material surface to static charging and are not recommended for use in critical ESD assembly locations. Stainless Steel Desiccators provide clean, high-density storage for both cleanroom and assembly applications. Compared to acrylic desiccators, stainless steel provides increased maximum weight capacity and longer durability. Constructed of conductive stainless steel and wire grounding for ESD protection is available as well. Stainless desiccators also meet stricter insurance requirements as well as providing part storage privacy. 3 – What type of Options Should I Choose? If you need to control humidity in a desiccator cabinet, you will need a plenum chamber, flowmeter & bleeder valve. Without these options, a desiccator cabinet becomes just a storage cabinet. Here you will find a short description of each of our options to aid you in choosing the best options for your unique application. Plenum Chamber – A pressurized housing at the back of the desiccator, which contains nitrogen gas or clean dry air CDA at a positive pressure. The inner plenum chamber wall is perforated with exit ports into each compartment to allow uniform gas flow throughout. The back wall of the plenum chamber is removable for easy access during maintenance. Flowmeter – Functions as the N2/CDA inlet for our desiccator cabinets and controls CFU gas flow rate. Automatic Bleeder Valve – Continuously and automatically relieves excess N2/CDA to prevent air pressure build-up in the cabinet. Grounding – Grounding wire connects from racks, stainless steel plates, shelves, hinges & latches to hard ground for ESD applications. Shelves – If you decide you need shelves for your desiccator, there are a couple of options available. Each desiccator compartment can have up to 3 shelves. The type of shelf will depend on the type of desiccator you’ve chosen. Clear acrylic desiccators have the most choices available with solid acrylic or perforated stainless steel shelves. 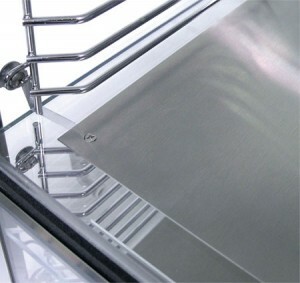 Static dissipative acrylic and stainless steel desiccators can only have perforated stainless shelves. 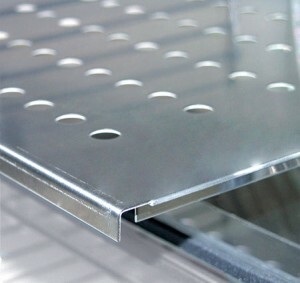 Perforated SS shelves have the added benefit of improved air flow in each chamber. Up to 18″W 1/4″ Solid Acrylic 25 lbs. 24″ – 48″ 1/4″ Solid Acrylic 25 lbs. 24″ – 48″ 3/8″ Solid Acrylic 40 lbs. All Sizes Perforated Stainless Steel 40 lbs. Stainless Steel Plates – Mounted on each compartment floor to protect acrylic from surface abrasion and to enhance grounding. Nitro-Save® – Solid state sensor system for accurately controlling pre-set relative humidity. Displays current humidity level and temperature. Choose in lieu of a hygrometer, when you need to accurately control RH% for sensitive parts storage. Digital Hygrometer – Displays current humidity level and temperature. Mounted in an acrylic pocket or free standing in stainless desiccators. Not required with Nitro-Save®, this unit does not control humidity, only displays it. Camlocks – Locks for desiccator compartment doors. You have the option of having the same key open all locks (keyed alike) or different keys for different compartment’s locks (keyed differently). ID Pockets – Door mounted card holders allow the labeling of compartment contents. Stands – Our larger desiccator cabinets are not designed to sit directly on the floor. Durable steel stands lift the desiccator off the floor to prevent damage to bottom compartments and allow for easier access to all compartments. Lockable casters provide enhanced mobility and this is especially important for very large heavy desiccator cabinets. 4 – What makes a TDI Desiccator Cabinet different from our Competitors? All TDI acrylic desiccators are constructed with heavy-duty 1/4″ thick material rather than thin PVC, eliminating the need for costly stainless steel door frames. We use continuous door hinges as opposed to more flimsy intermittent hinges often seen on cheaper desiccator cabinets. Closed cell neoprene door gaskets are recess mounted into CNC machined slots to ensure integrity in placement and durability. 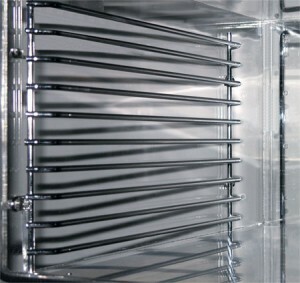 Our desiccator cabinet doors also include vertical and horizontal braces or “stiffeners” for even more added support. As a result, these unique design features both prevent door sag and ensure a perfect air-tight seal. Our unique Ultra Nitro-Flow system with cutouts in chamber walls and floors achieves a single pressure condition throughout multiple compartment desiccators. The benefits are twofold because while this system allows maximum flow in both vertical & horizontal directions, it also only requires one Nitro-Save® and bleeder valve for the entire desiccator. This is the most efficient and effective way to purge a desiccator with nitrogen or CDA. Typical competitor desiccator cabinets require expensive outlet valves and humidity control units per compartment. CNC machined acrylic to assure precision accuracy and reproducibility of each TDI desiccator cabinet. TDI offers the best of the best! Our desiccator cabinets are constructed of the highest quality material. They are the most durable while providing the highest density storage. We’ve all heard the phrase “you get what you pay for”. We put the time and dedication into each desiccator to provide you with a product that will stand the test of time.